Sightings of this unidentified creature date back to Indian times. Many a canoe along with it's occupants were lost to the ferocious beast dubbed "BIG OTTER" according to local folklore. In the late eighteenth century it became known as "STINKY". The name is in reference to the foul smelling Perfume Pond where most of the sightings have occurred. Perfume Pond is a three mile long body of water fed by an unknown underground source on the east side of Killville. It's called Perfume pond because of the distinct odor it acquired from the dumping of waste from the now closed textile mills running along it¹s north shore. It's glacier carved bottom is said to reach depths of over four hundred feet at some points. The water temperature remains very cold even in the summer months and visibility in it's murky depths is poor. The creature is believed to be of the same species or at least related to similar creatures said to inhabit Lake Champlain in upstate New York and the Chesapeake Bay. 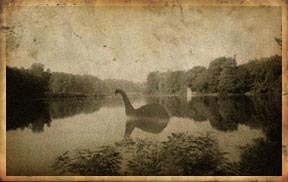 It is speculated that the creatures may be plesiosaurs, an animal long thought extinct. 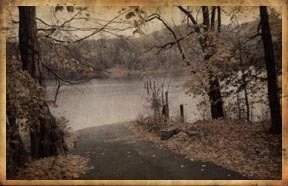 One theory holds that the pond is connected to the Connecticut River via an underground cavern. This could explain how a creature of this size (25 to 40 feet) could exist in such a small body of water without being seen more often. The last known photograph of Stinky was taken by Roger Berman, a worker at the Hampton Mill in 1952. The photo was widely believed to be a hoax but Berman swore on it's authenticity right up until his death in 1965. Reality or hoax, something in Perfume Pond sent Bennie Martunis to an early grave on September 7,1973. Martunis disappeared while fishing from the boat landing off of Ferry Street near the old Hampton Mill. There were strange marks in the mud that seemed to indicate that he had been dragged into the pond by something, but the tracks could not be identified. Two days later the blood stained remains of his jacket were found about a mile away washed up on shore.